NEWPORT, RI – At its Dec. 5-7 meeting, the New England Fishery Management Council approved Framework Adjustment 57 to the Northeast Multispecies (Groundfish) Fishery Management Plan. 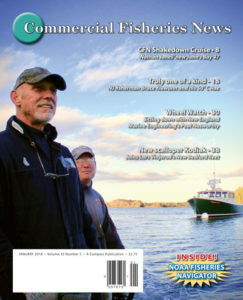 In addition to setting 2019-2020 specifications for catch limits, the council fine-tuned trimester allocations of total allowable catch (TAC) in response to overages for six stocks in the common pool (CP), modified the common pool’s accountability measures (AMs) management, modified AMs in the Atlantic halibut and southern windowpane flounder fisheries, and set the Atlantic sea scallop sub-ACL and other non-groundfish fisheries sub-ACLs for flounder stocks. The new annual catch limits (ACLs) for the 19 groundfish stocks were set using data from the 2017 operational assessment.